The path from LSAT to license, traced in a coming-of-age, full-of-panic-attacks memoir from a graduate of Columbia Law, class of ’97. Fresh from the University of Wisconsin, Kimes had the notion that lawyers simply argue. Arriving at New York’s Morningside Heights with a new husband, new hairdo and much trepidation, she joined her fellow bewildered freshmen in their peculiar competition. Each aspiring counselor was a strong character, and hastily formed friendships were as likely to expire as to thrive amid the first-year terror at an institution replete with top-tier Ivy prestige. Kimes describes the fear saturating the lecture halls as cases were dissected in the ancient Socratic way. 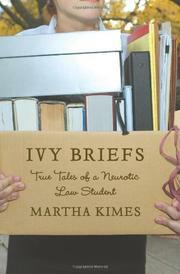 She coped by maintaining a close relationship with study outlines, casebooks, texts and hornbooks. Preparations for the first set of exams were especially stressful. Happily, things improved for our lawyer-in-training. She nabbed a summer clerkship with a federal judge, the executive editor’s post on Columbia’s transnational law journal (though not the Law Review) and, ultimately, a job at a “Lavish Law Firm.” All that remained was the bar exam. She passed. This edgy, solipsistic narrative will help explain why Ivy League lawyers tend to have a self-reverential sense of entitlement—they picked it up in law school. An antic case study illuminating how a lawyer is made in frisky prose infused with attitude.